The new elementaryOS Freya has been released some months ago, but I'm writing this article now to be able to give you a feedback after a long usage. I've been using this distribution since 0.2 Luna and I'm going to give my opinion of the new 0.3 Freya. TL;DR: Use elementaryOS if you are new to Linux or if you don't want to bother much with settings. First, a little presentation of the elementaryOS project. Before being an operating system, it was a set of icons for the desktop environment GNOME. As it had a huge success (since 9.10 Ubuntu's default icons are derived for the elementary set of icons, thank you frenchWikipedia), the creators decided to create their own GNU/Linux distribution. Their aim is to make Linux pretty by giving a coherent look between the applications and by designing a beginner-friendly user interface, without having to use the terminal. In my opinion, the work they do is great in the sense that it can seduce users coming from proprietary operating systems like Windows and OSX. Usually, the community of open source recommends beginners to try HandyLinux, ZorinOS, or Ubuntu of course. In comparison, elementaryOS has a nearer look to OSX from Apple, and this kind of aesthetic has already seduced millions of people around the world who are not at all computer power-users. Of course, Ubuntu has a great community and is the most known Linux. It has also improved a lot the user experience by making the installation very easy and managed to already attract lots of users to the Linux community. However, I think that the elementaryOS project is going even beyond by attracting also average users and not only those who are at least "tech-curious". In my opinion, elementaryOS is the new Ubuntu and will help linux-based distribution to go a step further. 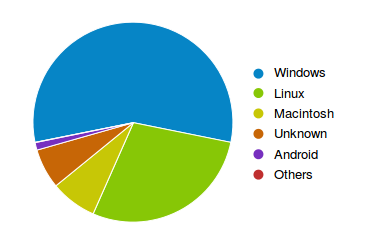 As the statsshows, more than 60% of elementaryOS downloads are from proprietary operating systems. As usual with Ubuntu-based distribution, the installation was quite easy and as it is the same as on Ubuntu, I won't talk about it. Let's got straight to the first screen after the login. As you can see, there are no icons on the desktop and you will never be able to put some. It is a decision taken by the project owners since the first version of the distribution. They are some people who are criticizing this, but I was always happy with this as I like to keep things clean. What a pretty landscape to begin with elementaryOS! 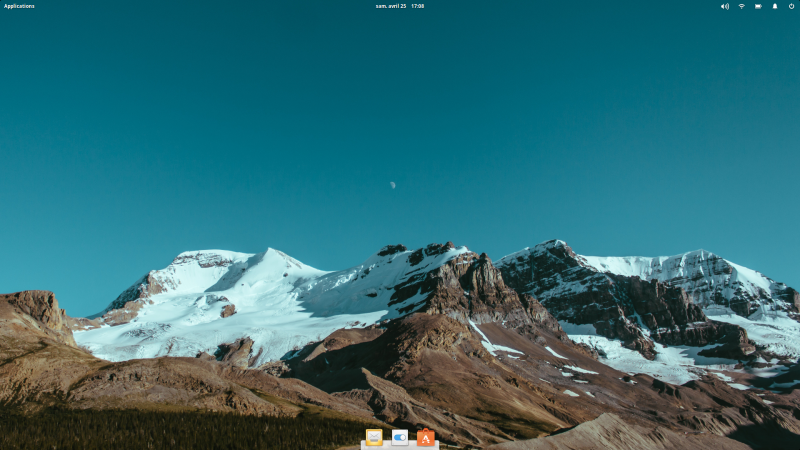 Already using elementaryOS Luna on another computer, I was wondering if I should install it on my computer for development because I felt too limited on Luna (almost like on OSX) in terms of design. For example, to be able to open the terminal directly from the file manager at the same location, I had to install a little software first. But now this functionality is native! Another huge thing is notifications. As you can see below, you now can get notifications when a line command has finished. Furthermore, if you click on it, it will open the corresponding window. And if it is a terminal, you will see a check in the tab. I'm quite glad that they thought more on the usage for developers and made the UI attractive for them. Now the cons. I'm using elementaryOS since Luna went stable and I've currently one PC still in Luna (i'm going to reinstall it soon), and an another one with Freya (the one I'm writing this article). However, even though Luna was quite stable at the beginning, they are bugs that I don't accept, especiallly concerning the file manager. The bad part is that on Freya on the other computer, I still have bugs with the file manager. On Freya, I also have a little issue: the shortcut to switch between windows is Alt+Tab and to switch in the other direction is Alt+Shift+Tab. However, this last shortcut doesn't work every time and I have to change the keyboard configuration to make it work, sometimes several times because also configuring the keyboard doesn't always work (I have reported the issue on Launchpad, but got no answers). In conclusion, as said earlier, I recommend this GNU/Linux distribution for beginners and I would even recommend elementaryOS over Ubuntu because it is more lightweight and more attractive to mainstream users. For example, one of my schoolmates tried elementaryOS by itself (he didn't ask any help), replacing Windows 8, and now loves how fast it is. However, I find they are a little bit too much of bugs for this kind of distribution and I don't accept it anymore. So for my purpose I'm now migrating to Arch Linux. Yes, it sounds funny as this distribution is not known for its stability but at least I have the feeling I can control everything what is happening and by the same way to be able to fix myself the bugs. You found an error in this article? Some advice? You can send a comment by email to "blog at killiankemps.fr" with "[Comment][en][elementaryOS Freya, the new Ubuntu]" as subject.